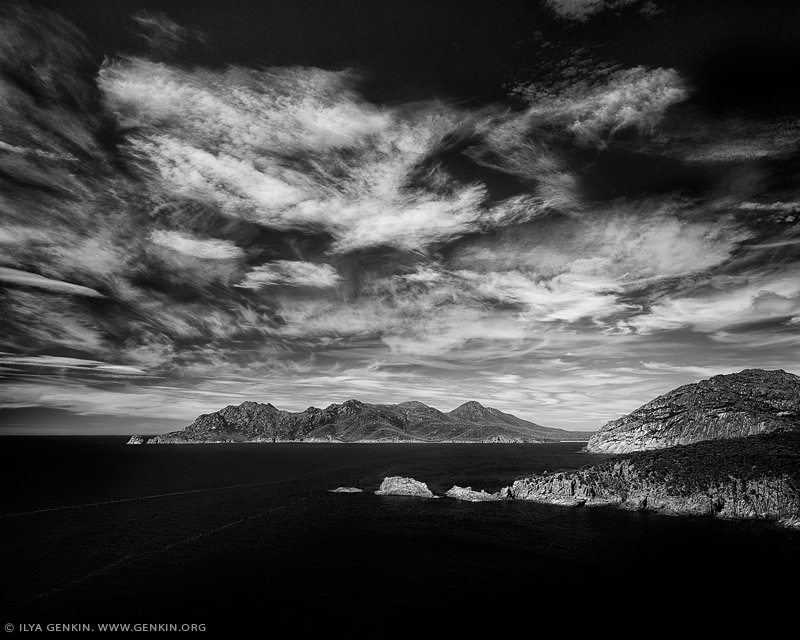 Black and white fine art photo with dramatic sky above The Hazards, Schouten Island & Wineglass Bay as it was seen from Cape Tourville, Freycinet National Park, Tasmania, Australia. This image belongs to the travel and nature stock photo library. This stock photo of Dramatic Sky Above Cape Tourville is available for licensing for commercial and editorial uses including websites, blogs, books, magazines, brochures and advertising. Restrictions may apply for images which contain third party copyrighted material or sensitive subjects. Photos of artwork are for editorial use only. This image id AUSTRALIAN-COAST-BW-0006 of Dramatic Sky Above Cape Tourville, is copyrighted © by Ilya Genkin. This is not a public domain image.